At the Mexican Grand Prix on October 29, Britain's Lewis Hamilton sealed his fifth Formula 1 World Championship, becoming only the third driver in history to reach this tally. He’s currently gearing up for his next F1 race in Brazil while revving up a multitude of side projects, which leaves very little free time for anything off-the-track. But he still finds time to dip his hands into everything from a multi-year partnership with IWC watches to a multi-season design collaboration with Tommy Hilfiger. On top of that, the athlete has found a new sport to excel in—diving. The new hobby has also sparked a new passion for ocean conservation. We sat down with Hamilton during a recent appearance at IWC’s New York City boutique to find out how one of the fastest men in history finds the time to put on the brakes. What do you do when you’re trying to unwind? Time is very, very precious, so a luxury for me is when I get to spend time with my family. The other day I was at my team factory and I managed to have something to eat and go see my sister and spend time with the kids. It’s a good thing having a niece and nephew because you can give them back. But, there is just no substitute for time with them. I also love music, so I listen to music a lot on flights, for example. That’s where I spend most of my time—and I jot down a lot of ideas. I have a lot of stuff stocked up. When a crazy idea comes up, I try and make the most of it and then I try to figure out later how I can expand on it. Have you put any of those into motion recently? Well, the mastermind plan was to do a collaboration with Tommy Hilfiger. Actually, it was to win the World Championship as many years as possible, but also do a collaboration with Tommy Hilfiger. That was the ultimate goal. I wanted to bring in something new and bridge a partnership with someone and to design—I can’t believe it actually happened. When you set your sights on something and it actually comes to fruition it’s amazing. I just signed up for the third collection, which comes out at the end of next year. Do you ever want to do a collection under your own name? I do. Since I’ve got into it, I mean I was always at the fashion shows. I really loved being at the fashion shows. I’m really inspired by people like Virgil Abloh and Alexander McQueen, as well as a lot of these great up-and-coming British designers. I definitely want to continue to be in that space. 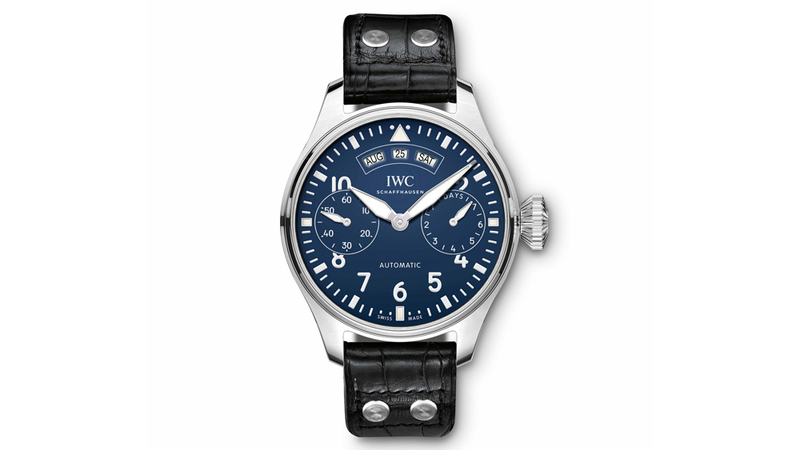 When did you first become linked to IWC? It was 2013 when I joined the team. I was aware of the company and their history, but when I joined them, I had the option to do something with them that was an actual partnership. When I was asked to do watches, I was like, ‘Yeah I love watches.’ I got to visit them in Switzerland and see how everything was made and I’m like, ‘Wow! How do you fit 500 pieces into one of these?’ My respect and appreciation for them went even further and now I’m a watch collector. I’m always looking out for luxury timepieces at auction. What watch do you wear as your everyday watch? Have you collected other brands? Well naturally when I was younger, I was into watches but I never could really afford them and then when I joined my first team, I started to kind of get into it a little bit, but I wouldn’t say I was a big fan of those watches at the time. I reckon it was around 2010 when I started to get serious about making investments because my friend in L.A. is crazy about watches. So he’d send me a pictures. He was like, ‘Hey, this is a unique timepiece for this era and there were only seven of them made.’ I would get super excited and would say, ‘Tell me why.’ Then when you hear about the development and the background and the small, minuscule movements you start thinking, “Oh wow.” For example, the tourbillon . . . it’s incredible how the tourbillon works. How about cars? Is there a dream car you don’t have yet? I have most of my dream cars, but I’m always now looking for what’s next. I don’t think lightly on it. I take a lot of time to figure out what I’m going to get next. Collecting cars is easy for me though. I don’t have a massive, massive collection compared to people who really collect. I think probably about 10, 12 maybe. Which car is the most important to you? It’s probably my AC Cobra. My muscle car. When I discovered this car I did not know the history so I got in touch with Caroll Shelby. I managed to get him on the phone. I said, ‘Firstly, I’m a big fan. I’ve read about your history. I was wondering if you could take a look at this car. I really want to make sure I’m doing the right thing investing in a real original. He told me it was one of the best originals he’s seen in a long time so I bought this car, which has his signature in it. Unfortunately, he passed away a couple months later. That one I don’t drive. I just can’t stand the idea of someone crashing into it. We hear you are also into scuba diving. Do you like dive watches? I only have a Suunto dive watch. I only just passed my diving lessons in the last year. I’ve probably done like 10 dives since then but I want to go to Galápagos and dive out there. I’m also trying to find an organisation to partner with in terms of cleaning up the oceans. I really want to get involved in it. How many IWC watches do you have at this point? I must have at least 10. And you wear them all?